Skin markings on babies fall into two categories: those present from birth (congenital) and those that develop after birth. Depending on the type, these are very common and usually little cause for concern. Baby acne: Many babies develop acne shortly after birth. Though the cause is unknown, there is a theory that Mom’s hormones during the last weeks of pregnancy cause these tiny pimples. There is no reason to treat these pimples—a mild, unscented soap and water is all that is needed to cleanse the skin. They will go away on their own in a few weeks or months with normal cleaning. Peeling skin: Nearly all newborns have peeling skin, especially if your baby was born after the due date. The peeling will subside in two to three weeks, leaving soft newborn skin visible. Milia: Milia are tiny white bumps on the skin, typically on the cheeks, nose, and chin. Blocked oil glands are the culprit, and these disappear after the first few weeks of life. Erythema toxicum: This blotchy rash has a raised center and uneven border, often resembling a fleabite. You can sometimes see a yellow or white dot in the middle of the reddish blotch. This rash appears within the first week of life and will disappear on its own. 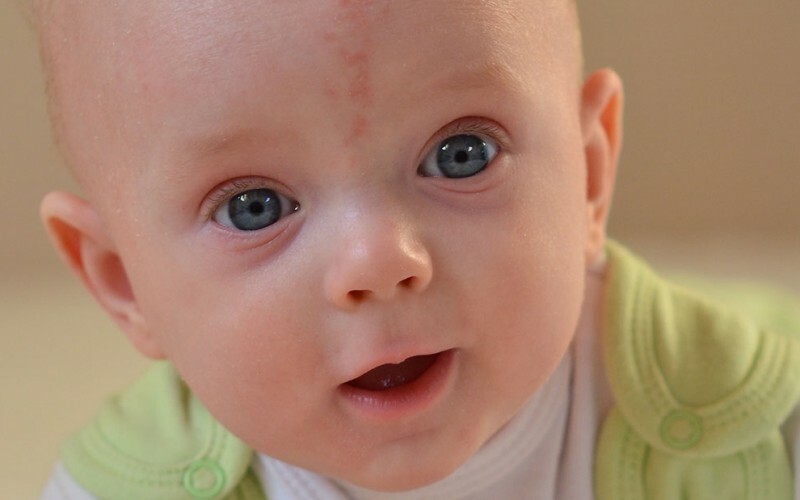 Cradle cap: Your baby might develop this crusty-appearing rash at about one month old. Found on the scalp, it can spread behind the ears, and then down to the neck. For cases of cradle cap, simple remedies are available, and your pediatrician can advise you on their preferred treatment. Eczema: Babies sometimes develop eczema (also known as atopic dermatitis) around 3-6 months of age. These red, itchy patches can be found nearly anywhere on the skin. Causes include allergies or very dry skin (more common in winter). Generally, a doctor’s help will be needed to diagnose and treat eczema, but you can take steps to reduce eczema such as keeping your baby’s nails clipped and applying a mild, unscented lotion frequently to soothe your baby’s skin. Prickly heat: Usually seen in hot weather, this rash can develop in areas where baby sweats, like in the diaper area, or, particularly, under the neck, chest and armpits. The best treatment is to keep your baby cool and dry, and to make sure that your baby’s clothes are loose-fitting and made of breathable material. Fungal infections: Baby “thrush,” which looks like patches of milk on your baby’s tongue or side of the cheeks, is caused by a common fungus called Candida. That same fungus can also show up in the diaper area or in your baby’s fat folds, where the rash will instead look bright red. Thrush and fungal skin infections are typically treated with prescription anti-fungal medicines. Erythema toxicum, milia, and neonatal acne are all common in newborns and go away on their own after a few weeks. Eczema develops around three months of age and can appear dry, red, and itchy. A gentle unscented lotion can help. Cradle cap is a common skin rash of the scalp that appears around one month of age. Fungal infections include some diaper rashes and are treated with a prescription medication. National Institutes of Health. Birthmarks. It took a while to take my sons photo because I did not want his baby acne to show. Although it seem like it is getting worse, I feel better knowing that it will go away soon. I know, it can really mess up those adorable newborn pics. But hang in there, he will have beautiful baby soft skin before you know it!